For more than 100 years, MARS Chocolate North America has made the world’s most beloved chocolates. With a rich heritage in chocolate making, we have a thirst to learn and share everything there is to know about chocolate. It’s our legacy. Chocolate has been woven through the fabric of our culture for centuries. The stories of chocolate are the stories of our ancestors. That is why MARS partners with historic sites and museums across North America to share educational presentations that allow you to taste the journey of chocolate through time. We created American Heritage Chocolate, to let you taste history. 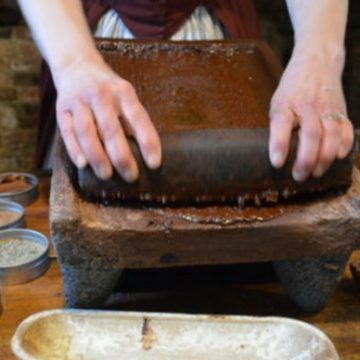 It is an authentic historic chocolate product that uses only ingredients available in the 17th Century.